Hats off to all of my friends who imbibed the hype and embraced “dry January” or went on one of those ten to (gasp) thirty-day cleanses. Suffice it to say that I did not do any of those things. I did however work diligently on trying to incorporate more cardio into my weekly routine and really tried to slash my portions in half. Next November at my annual physical I hope to impress my doctor with a lower weight and better BMI. That said, one of my greatest pleasures in life is cooking and eating. While many here in the desert hit the links, I like to click on recipes that magically appear in my inbox, read my library of cookbooks, and slosh though the mounds of cooking magazines that I know Marie Kondo would like me to pitch. But I’m sorry there might just be a diamond in that endless stack. When my husband and I drove west this fall, I filled the corners of our SUV with bags of cooking magazines that I had accumulated over the years. Over nine states I made a slight dent in my collection. I did find several treasures. And I am actually having a blast reading though all these recipes. Boy do I miss Gourmet magazine! 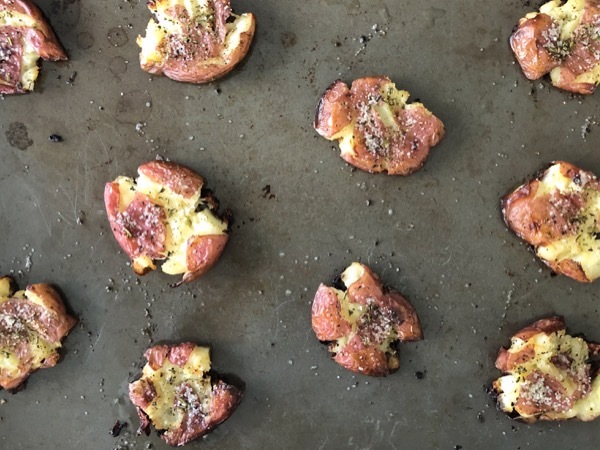 And it’s crazy how Bon Appetit, Cook’s Illustrated and NYT Cooking have figured out a way to derail my days with their recipes into my inbox, creating endless digital piles but no actual paper ones. Here’s a recipe I discovered driving though New Mexico. It’s from fifteen years back. I’ve updated it a bit, making it a bit less caloric and figuring out how it can be prepared pretty much ahead of time. I will say it’s a gem in the haystack. And how appropriate a name for all those monthlong teetotalers- smashed potatoes. 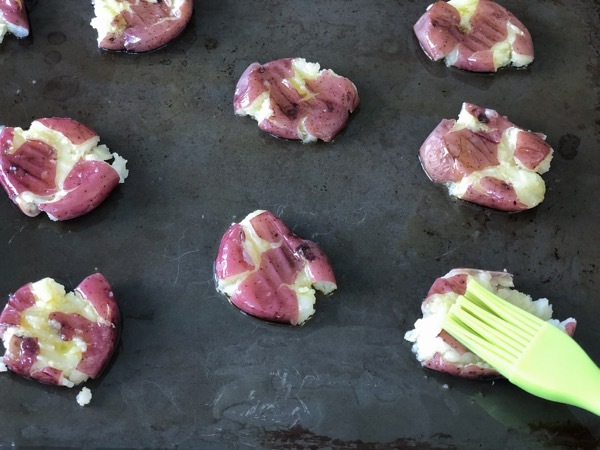 Start with 12-16 small red skin potatoes, they should be the size of golf balls or smaller. Fill a large pot halfway with water. Bring to a boil. Liberally salt the water. Add the potatoes, bring the water back to a boil. 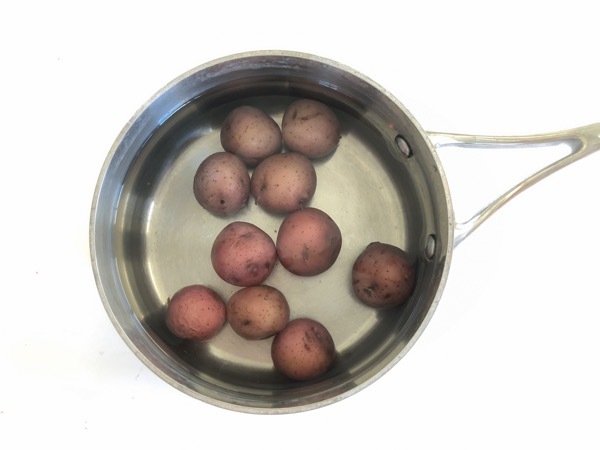 Lower the heat so that the potatoes cook at a rolling boil for about 15 minutes, or until fork tender. Drain the potatoes and set aside. You can also put them back in the dry warm pot to dry even more. Preheat the oven to 450 degrees. 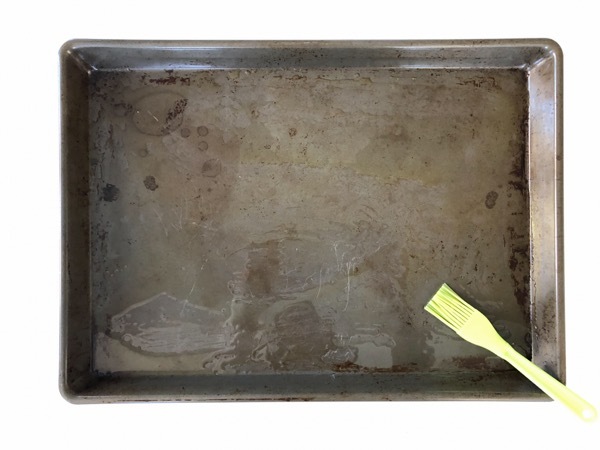 Drizzle some olive oil onto a rimmed baking sheet and with a basting brush spread to cover. 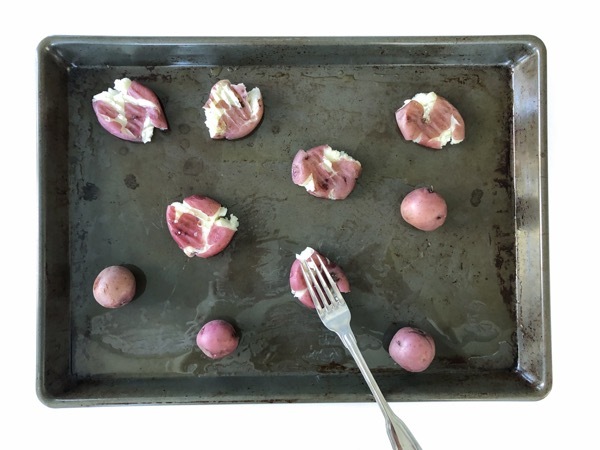 Place the potatoes on the prepared sheet pan, taking care to space them so that they aren't too close to one another. 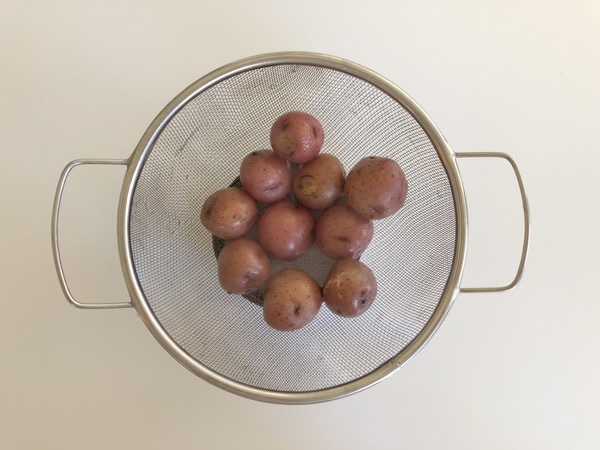 Using a potato masher, fork or the bottom of a drinking glass press down in the center to slightly smash each potato. 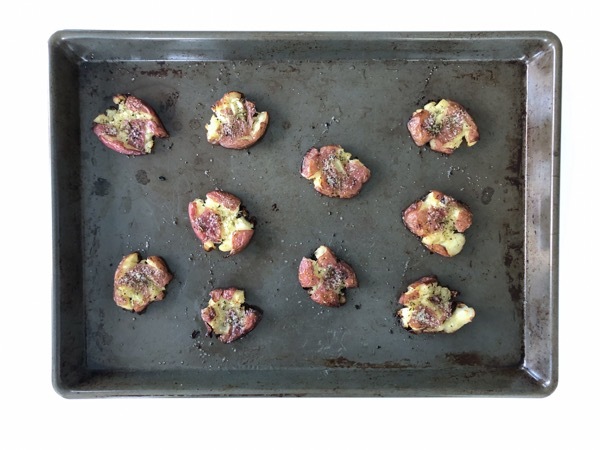 The goal is to get each potato to about ½ inch thickness, without breaking the potato apart. 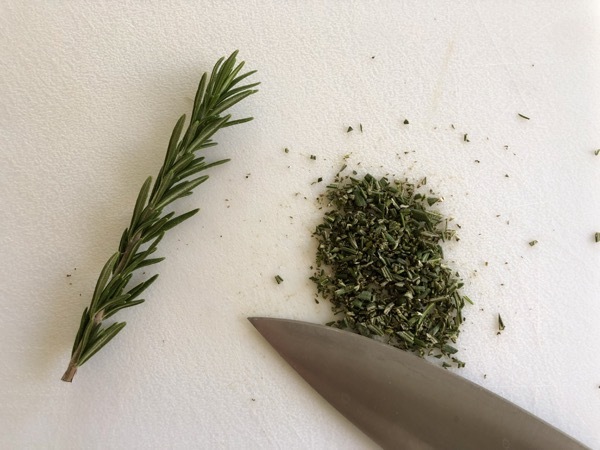 Destem and finely chopped a ½ teaspoon of fresh rosemary. Drizzle a little olive oil over the tops of the potatoes, then using a basting brush, brush around the entire potato. 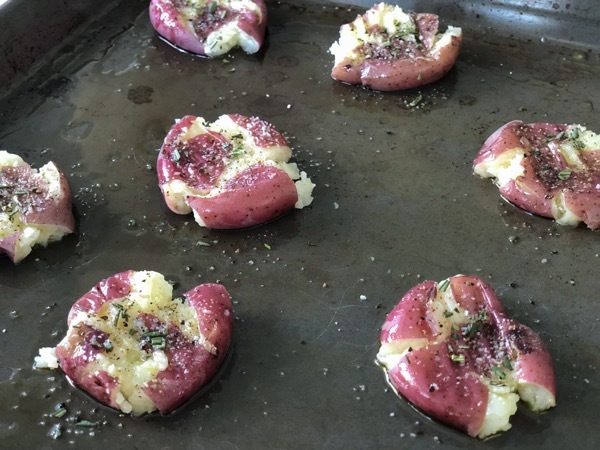 Sprinkle each with kosher salt, pepper, and a little chopped rosemary. Bake for approximately 20 minutes, or until browned on the top. The potatoes can be made a couple hours ahead of time. Cool completely. 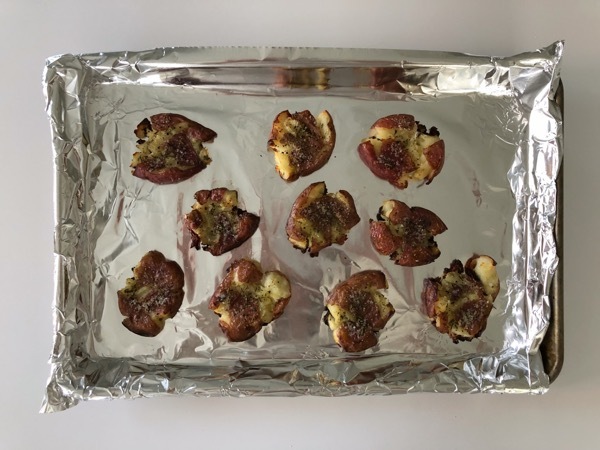 Place on a small rimmed baking sheet lined with foil, then cover with another sheet of foil and refrigerate. Heat oven to 400 degrees. Bring potatoes to room temperature. Still covered in the foil reheat for 10-15 minutes or until hot, remove the foil and crisp up for another five minutes. You’re going to want to drink this one up. 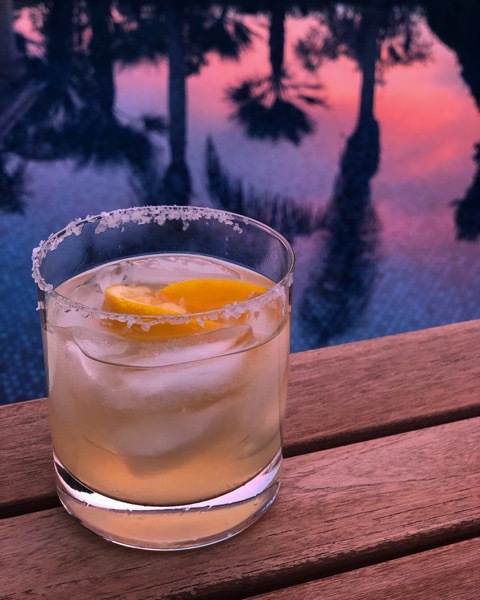 And speaking of drinks- here’s a snap of a fresh meyer lemon margarita that I made from one of the trees in my desert backyard. My motto, raise a glass and drink in all that life has to offer!